* Although we don’t choose recipients based on financial need, we ask applicants to keep in mind those writers and illustrators who could not otherwise attend the conference without this opportunity. Thanks! – You live in Wisconsin. 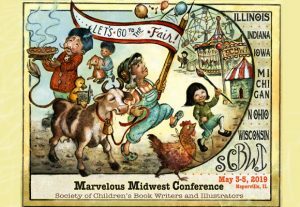 – You haven’t won an SCBWI-WI full conference grant in the past, such as a grant to the SCBWI-WI Fall Conference. – You identify as a person belonging to a community that is underrepresented in children’s literature. These communities include, but are not limited to, people of color, LGBTQIA+, religious and cultural minorities, persons with disabilities, Native/First Nations, immigrants. If you’re unsure about your eligibility, feel free to ask us at wiscbwidiversitycommittee@gmail.com. – You have not yet published a book for children or teens through a PAL-level publisher. You can find more details about what that term means on our PAL Guidelines page.